This stylish Full HD OLED widescreen provides a premium viewing experience allied with a great Smart TV platform in the shape of webOS. Unbeatable black level performance, rich deep colours and the wafer-thin screen provide tempting compensation for those prepared to pay the steep early adopter price tag. 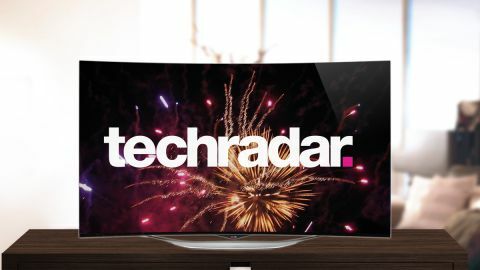 For time immemorial, OLED has been heralded as the future of TV. Brighter, bolder, thinner and prettier than LED LCD and plasma combined, it seemingly has everything going for it. The catch is that it's devilishly difficult to commercialise, with only one brand, LG, making a real fist of production. It's also very expensive, with the LG 55EC930V coming in with the premium price tag of £1999. But things are looking up. The 55-inch EC930V is the first of a new wave of OLED panels bolstered for the first time by LG's slick and inviting webOS Smart platform. It's also the forerunner of a much larger OLED push by the brand which will play out throughout next year. While there are 4K OLED iterations waiting in the wings, in the shape of the 65-inch Ultra HD 65-inch 65EC980V and 77-inch 77EC980V, the 55EC930V reviewed here is pragmatically Full HD. It's curved, as is LG's current wont, and offers a wide range of familiar connected functionality. Electronics and in/out ports backpack from the curved panel, which is reinforced with carbon fibre to give it strength. There are three side facing HDMI inputs (one of which is MHL compliant), plus a trio of USBs, a headphone mini jack output and PCMCIA card slot. Downward facing is another HDMI, which is ARC enabled for routing audio back to an AV receiver or soundbar, plus terrestrial aerial and satellite feeds, a component AV input via an adaptor, an optical digital output and LAN jack. Naturally, you don't have to hardwire your network connection. There's dual band wireless support for 2.4 and 5Ghz, as well as Wi-Fi Direct. If your building and router distance doesn't preclude it, it's sensible to opt for 5GHz to reduce dependence on what's often an overcrowded Wi-Fi band. Two remote controls are provided; a short, functional infra-red wand and LG's latest Magic Remote pointer. For the most part, the latter is the most convenient way of navigating around the set, although you will occasionally need to use the IR. The set is light, tipping the scales at just 16.7kg with stand. The panel is amazingly thin at 4mm. There's no mistaking an OLED picture when you see it. With an impenetrable black level performance, bright dynamic peaks and deep rich colours, the technology provides eye candy of the boldest order. Picture performance is quite low maintenance too, as routing around the calibration menus doesn't offer too much in the way of rewards. Picture modes, which comprise of vivid, standard, eco, cinema, sports, game and two ISF expert modes, are pretty spot on straight from the box. As OLED is a self-emissive technology it doesn't require a back light; the result is an even cloak of velvety black. This ability to deliver solid black without fear of wobbly edge lighting, so familiar on LED LCD, has a big impact on letterboxed movies. The image is crisply framed with no hint of unused screen or bezel; in a darkened room it's like owning a 21:9 display. The only time I've seen a similar effect was from final generation PDP panels produced by Pioneer and Panasonic. There are less obvious benefits claimed too. Apparently, science says that OLED emits less blue light than an LED backlight LCD, which is apparently beneficial to your peepers. Blue light is a part of the visible spectrum between 380nm and 550nm. Make of that what you will. In some sense though, OLED flatters to deceive. While the panel does absolute black absolutely, its grayscale isn't that different from other panel technologies. You'll find no more shadow detail on your Blu-ray's here than you'll see on a high spec LED screen. What it does do though is hold colour spectacularly well at low grey levels, which helps even dimly lit images retain a certain lushness. Colour vibrancy is high but rarely garish. As Paul Bettany kneels before the sunflowers early on into Transcendence, the colour palette maintains a vibrant balance between skin tone authenticity, deep green leaves and vivid yellow flowers. LG's WRGB OLED panel technology shines with such bold hues. There's no immediate loss of intensity when viewed at an angle either. LG quotes the effective viewing angle to be up to 160 degrees. The picture retains its snap regardless of where you're parked. The effect of the curve itself is rather subtle, which inevitably begs the question 'Why bother?' LG's engineers have confided to me that curving the set involves some challenging engineering and is not undertaken lightly. Although much is made about the curve being immersive, at this screen size I remain unconvinced. At best it's little more than a benign bend. The screen's 3D performance is excellent. As you'd expect from LG, the panel embraces passive polarisation. This means no light source flicker and no great glasses expense; any polarising specs will do, including the Real D ones from your local cinema. OLED's inherently fast response time pays big dividends here. Four pairs of passive 3D glasses are bundled in the box. Inevitably there's a certain amount of jaggedness (this is a Full HD screen after all, and that equates to a loss of resolution with Passive technology) but the overall viewing experience is great. And as you might expect from OLED, the 3D looks bright and dynamic. Screen brightness in stereoscopic mode is rated to be 174 cd/m2 compared to 95 cd/m2 from a comparable LCD.